Dragons are fantastic mythical creatures - they fly, they breathe fire, yes they can be dangerous. But Chinese dragons bring good fortune! The dragon is my favorite mythical creature, probably because I was born in the year of the dragon! Dragons are typically portrayed as having supernatural or spiritual qualities - nothing mundane about your average dragon! The Western dragon usually breathes fire and has huge wings it uses to fly. The Chinese dragon brings good fortune and heavenly power. Dragons have long been regarded as pretty dangerous, likely to eat our animals if not human beings. They also gather treasure and protect it fiercely against dragon slayers. They are popular characters in fantasy, fairy tales, video-games and role-playing games like the famous "Dungeons and Dragons." Today, although they're still seen as powerful and potentially dangerous, stories written in contemporary times often feature dragons with many good qualities. I kind of like that! Dragons appear in the mythologies of most cultures around the world. Perhaps their most famous feature is that they breathe fire. They are my favorite of the legendary and mythical creatures. Well, I have to admit to a soft spot for the Loch Ness monster, but maybe Nessie's actually a kind of dragon that lives in the water! The most common type of legendary dragon breathes fire and flies using its large wings. They are usually portrayed as scaly reptiles, hatching from eggs, and sometimes have large eyes. Today dragons are thought of as pretty big creatures, but in the past they were often depicted as relatively small, not much bigger than a horse, or even very small like a bird or butterfly. Some dragons were able to speak and expressed feelings, while others were just wild beasts. In most historical legends dragons are portrayed as evil. They are guilty of preying on the livestock of the villagers, and sometimes even villagers. Well, I guess that would be bad! Actually, so bad that many villages apparently decided to sacrifice a nice young virgin to the dragon periodically in hopes that would keep it away. Dragons are also considered hoarders of treasures. They apparently gathered lots of gold and jewels and kept them safe in their underground lairs. In most of the legends about dragons they are portrayed as fierce dangers to humankind. In many cases, though, they provided a special, supernatural even, challenge for a hero to overcome in his quest to achieve some good purpose. 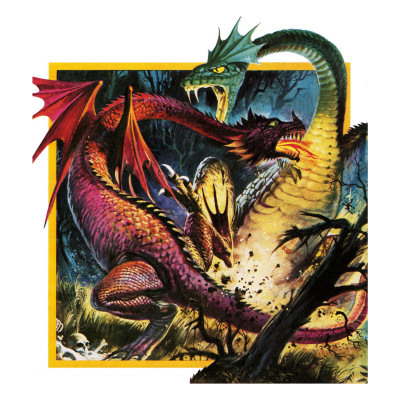 Sometimes this was just to get past a dragon, or retrieve some treasure that the dragon was guarding, but in many cases the task was to kill the dragon - so "dragon slayer" became one of the qualifications for heroes. Saint George is well known for slaying a dragon that had been terrorizing a city. The grateful people converted to Christianity. George became the patron saint of several European nations, including England, so I heard all about him growing up. Of course, since I lived in Scotland we weren't so impressed by his success in converting the English to Christianity, but slaying a dragon was still notable! 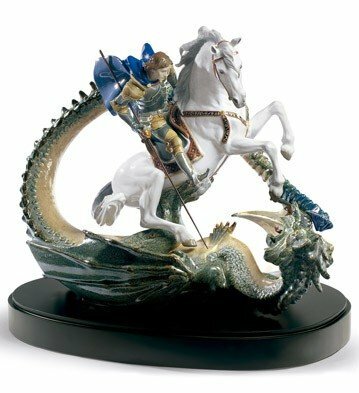 Lladro make the most gorgeous porcelain figurines, and some are of amazing dragons. Here, the dragon isn't doing too well - he's being killed by Saint George. So, not my favorite, but still a beautiful piece of art. The most amazing porcelain dragon figurines are created by the Lladro company from Valencia in Spain. Dragons may be powerful but they have not always been seen as harmful to human beings. One famous example is the Slovenian dragon of Ljubljana, who benevolently protected the city of Ljubljana, immortalized in a statue on the "dragon bridge" and pictured in the city's coat of arms. Seems like some people think dragons are kind of cute. 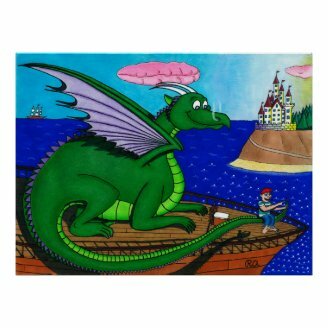 There's the famous song Puff, the Magic Dragon about a dragon that is surely kid-friendly. 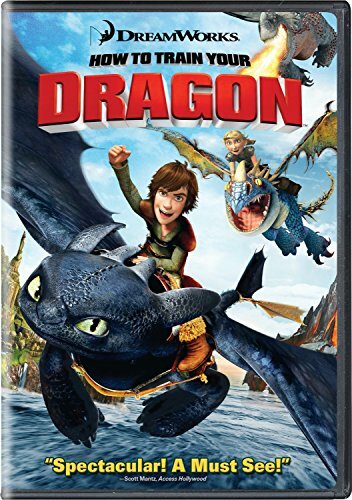 This is my favorite dragon movie! It features the last great dragon, Draco, who is the good sort. And he happens to be voiced by Sean Connery, which certainly makes him sound good! The movie is a lighthearted look at the last days of this last dragon and his fight against evil, assisted by a former dragon slayer, played by Dennis Quaid, and assisted by a rescued maiden (of course) and the ridiculous Pete Postlethwaite. Such fun! The Chinese, or Oriental, dragon is different from the Western version. This dragon is the one in the Chinese zodiac, the one that works on years not months. I was born in the year of the dragon so this is very interesting to me! The Chinese dragon has a long serpentine body and usually has a beard on its face. Even though it has no wings it still flies. It flies because it is a spiritual creature not bound by the laws of the physical world. 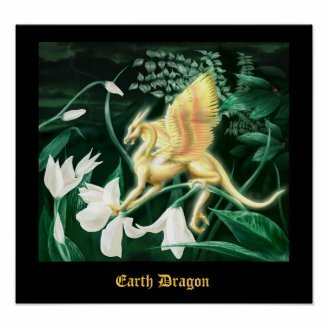 These dragons are mystical creatures with many supernatural powers that are described in different tales. Although they do not usually breathe fire, they can turn into fire or water, or clouds, or become invisible. 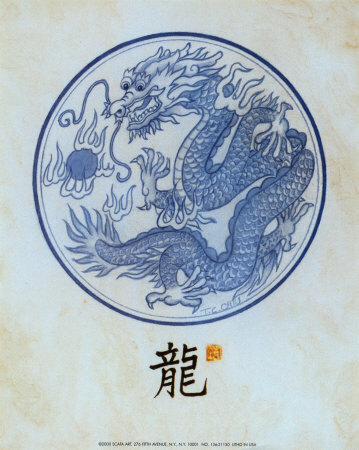 Unlike the Western dragon that is dangerous and usually considered evil, the oriental dragon is a powerful spiritual creature, benevolent and a bringer of good fortune. So, Orientals don't think dragon slaying is such a good idea! In China, the dragon was often adopted by emperors as a sacred symbol of power. Chinese dragons make rather attractive figurines. 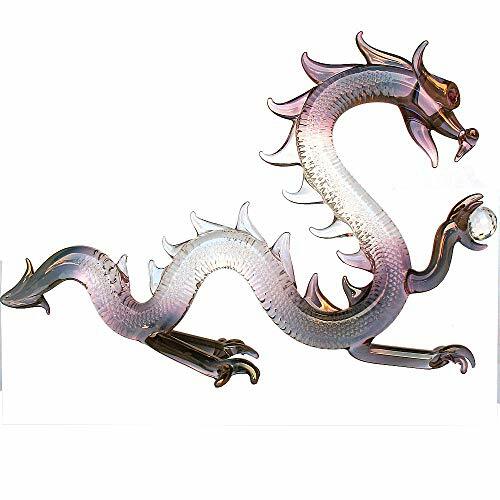 This glass Chinese Dragon is bearing the gift of Good Fortune! This is a hand blown glass sculpture by artist Kevin Prochaska and features a Swarovski cut crystal ball. The rainbow of colors is created by applying gold to the glass while it is still molten. This dragon is approximately 8.5 inches long and 5.5 inches tall. Dragons are such amazing creatures, from their physical appearance to their supernatural powers and on to the many tales that have been told about them. It is no wonder that artists have included dragons of all sorts in their work. Here are some examples that inspire me. 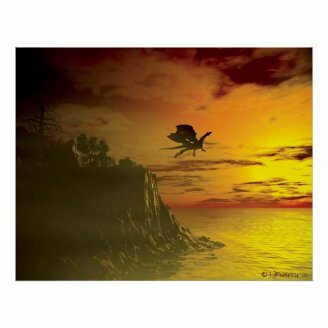 This first dragon takes flight across a beautiful sunset over the lake. 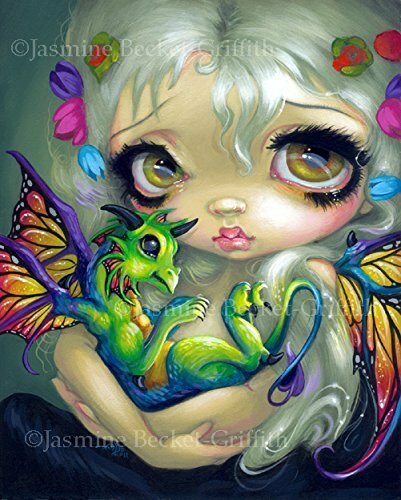 And then there's "a little golden dragon, landing straight on an orchid growing on the foot of a mountain, just before a storm is about to begin..."
Contemporary artist Jasmine Becket-Griffith has a whole series of works featuring "Dragonlings" - cute little dragons that seem to be friends with her big eyed fairies. This "Darling Dragonling," number 4 in her series of Darling Dragonlings, is one of my favorites. Look at those beautifully colored wings - the dragonling and the fairy match! Another movie portraying dragons in a good way! This is a fun movie that is actually very satisfying in many ways. Of course the fact that Gerard Butler and Craig Ferguson voice two of the main (adult) characters helps a lot! 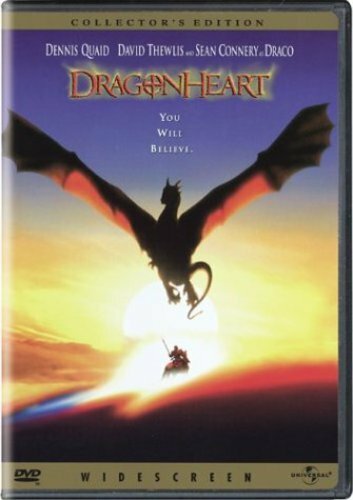 In this movie the dragons start off as the villains, and the good guys (the Vikings, yes, with Scottish accents!) are supposed to kill them. By the end of the movie, though, the Vikings have learned a lot about dragons and their attitude has changed in a way that seems to reflect an overall change of heart towards dragons in Western culture. 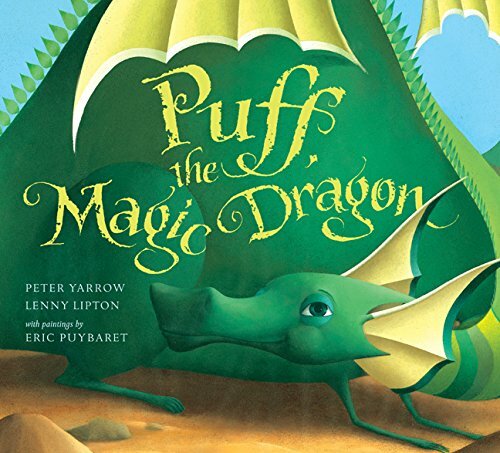 This picture book adaptation of the beloved song "Puff, the Magic Dragon" is a delightful gift for any youngster (or maybe just the young at heart!). You get not only a beautifully illustrated book telling the story, but also a CD with composer Peter Yarrow singing this song and several others. A wonderful retelling of the legendary tale of Saint George and the dragon. It won a Caldecott Medal as the best illustrated children's book in 1987. 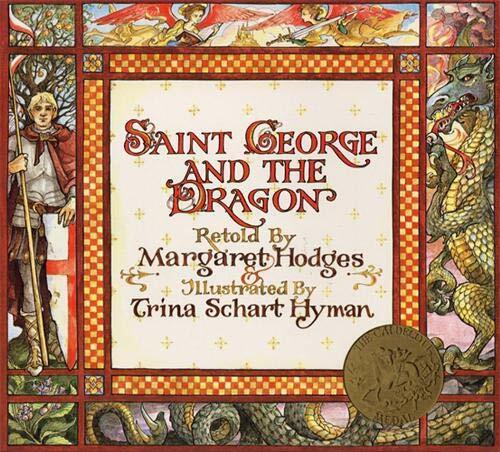 Margaret Hodges tells the tale and it is beautifully illustrated by Trina Schart Hyman. 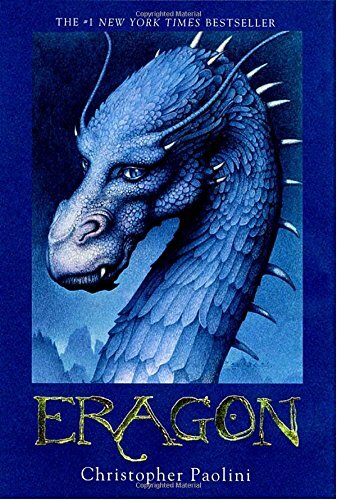 A boxed set of the Eragon trilogy by young contemporary author Christopher Paolini. 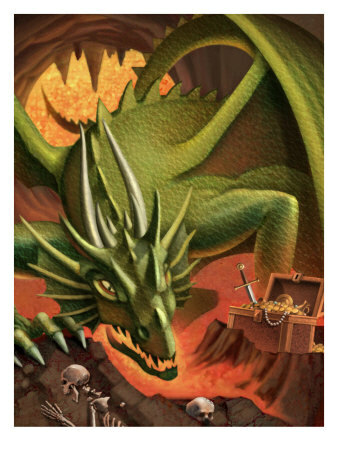 These stories fulfill all the characteristics of the older fairy tales, bringing together mythological creatures and a young hero and his dragon. As they come of age together they become embroiled in the battle between good and evil, the challenges of who to trust and the value of true friendship. Great reading for young and old alike! Article on Dragons at New World Encyclopedia. Article on Chinese Dragons at New World Encyclopedia. Some lake creatures can grow quite large, if they feed enough. Sturgeon can become a great size in lakes. Thanks for your comment. How terrible to say your dragon is a giant frog! It was a pleasure to read your article about the dragons, especially the part where you mention my hometown with a dragon as our symbol (rivalry cities are claiming it's just a giant frog). I am familiar with several explanations how dragon came into our coat of arms (the most famous is probably with Jason, who is sometimes credited as the founder of our town), but he is not benevolent in any of them. I suspect authors of Wikipedia made a mistake in this case. On the other hand, there are many examples of dragons of Eastern mythology, where they are portrayed as wise and helpful creatures. Ah yes, Tolkien had the great dragon Smaug. And indeed the Worms, Wurms, or Wyrms, were the snake-like dragons, while "dragon" comes from the Latin "Draco" and I guess is the origin of Tolkein's "fire drakes" like Smaug. Tolkien regarded dragons as an essential in all epic literature, for it is only through conflict with a dragon that one can become a hero. It is worth noting that in Anglo-Saxon a dragon was a Worm ,hence the folk song, The Langton Worm, is about a dragon, as is the Suffolk tale of Knucker, the water beast, who may be a primitive form of Odin, who was sometimes known as Nicor.